The Ministry of Health and Family Welfare, Government of India has launched Mission Indradhanush on 25 December, 2014 as a special nationwide initiative to vaccinate all unvaccinated and partially vaccinated children under the Universal Immunization Programme and sustain it by health system strengthening by 2020. The Mission focuses on interventions to expand full immunization coverage in India from 65% in 2014 to at least 90% children in the next five years. This will be done through special catch-up campaigns to rapidly increase full immunization coverage of children by 5% and more annually. 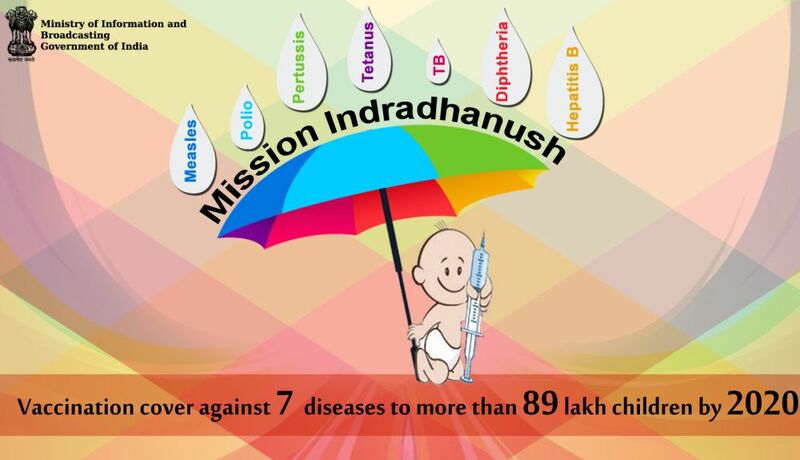 The first phase of Mission Indradhanush started from 7th April 2015, also celebrated as World Health Day. A concerted drive was carried on for a week or more (as the ground situation demanded) in the identified districts for four consecutive months till July 2015, starting from 7th of each month. For the first phase, the Health Ministry identified 201 districts with the highest number of partially vaccinated and unvaccinated children. These are termed as the high focus districts. Nearly 50% of all unvaccinated or partially vaccinated children are found in these 201 districts. 82 districts of these are concentrated in the four states of Uttar Pradesh, Bihar, Madhya Pradesh and Rajasthan and nearly 25% of the unvaccinated or partially vaccinated children of India are in these districts. These districts were targeted for intensive efforts to improve the routine immunization coverage in the country. The ultimate goal is to protect all children and pregnant women against vaccine preventable diseases in India. In the second phase of Mission Indradhanush, 352 districts have been selected including 279 mid priority districts, 33 from the North East states (from phase one where activity was postponed) and 40 districts from phase one where large number of missed out children were detected. The second phase commenced from 7th October, 2015. This will be followed by weeklong intensified immunization drives for three consecutive months, starting from 7th November and 7th December 2015 and 7th January 2016. Within the districts, the Mission will focus on the 400,000 high risk settlements identified by the polio eradication programme. These are the pockets with low coverage due to geographic, demographic, ethnic and other operational challenges. Evidence has shown that most of the unvaccinated and partially vaccinated children are concentrated in these areas. · Areas with low routine immunization (RI) coverage (pockets with Measles/vaccine preventable disease (VPD) outbreaks). · Areas with vacant sub-centers: No ANM posted for more than three months. · Small villages, hamlets, dhanis or purbas clubbed with another village for RI sessions and not having independent RI sessions. The special focus on the strategising, planning, implementation and monitoring of the execution process has ensured that Mission Indradhanush is one of the largest full immunization programs of the world, covering more than 75.5 lakh children and more than 20 lakh pregnant women through TT vaccine. More than 20 lakh children were fully immunized against seven vaccine preventable diseases. During the four rounds, about 9.4 lakh sessions were held during which about 2 crore vaccines were administered. Apart from vaccines, Mission Indradhanush has expanded the basket of services through provisioning of ORS packets and Zinc tablets. More than 16 lakh ORS packets and about 57 lakh Zinc tablets have been distributed. Mission Indradhanush is designed to be a national immunization drive to strengthen the key functional areas of immunization for ensuring high coverage throughout the country with special attention to districts with low immunization coverage. 1. Meticulous planning of campaigns/sessions at all levels: Ensure revision of micro plans in all blocks and urban areas in each district to ensure availability of sufficient vaccinators and all vaccines during routine immunization sessions. Develop special plans to reach the unreached children in more than 400,000 high risk settlements such as urban slums, construction sites, brick kilns, nomadic sites and hard-to-reach areas. 2. Effective communication and social mobilization efforts: Generate awareness and demand for immunization services through need-based communication strategies and social mobilization activities to enhance participation of the community in the routine immunization programme through mass media, mid media, interpersonal communication (IPC), school and youth networks and corporates. 3. Intensive training of the health officials and frontline workers: Build the capacity of health officials and workers in routine immunization activities for quality immunization services. 4. Establish accountability framework through task forces: Enhance involvement and accountability/ownership of the district administrative and health machinery by strengthening the district task forces for immunization in all districts of India and ensuring the use of concurrent session monitoring data to plug the gaps in implementation on a real time basis. The Ministry of Health and Family Welfare is working in collaboration with other Ministries, ongoing programmes and international partners to promote a coordinated and synergistic approach to improve routine immunization coverage in the country. A key feature of Mission Indradhanush has been the sturdy framework put in place for monitoring the effectiveness of the special drive. The Ministry of Health & Family Welfare has put in place a massive framework for rigorous monitoring of one of the largest immunization programmes of the world. The multi-level structure has been carefully designed to supervise and monitor the operations at the state, district and block levels through an army of health experts, officials and various partners. During the first phase, the WHO Country Office for India collated critical information on preparedness, including quality of task forces for immunization, deputation of senior officials to priority areas for monitoring, status of trainings at state, district and block levels and status of microplanning activities through its Surveillance Medical Officers and field monitors. The information generated was shared on a weekly basis with the Ministry of Health and Family Welfare for review and any mid-course correction. A total of more than 225 field Medical Officers, nearly 900 field monitors and more than 1000 external monitors were deployed by the WHO Country Office for India to monitor the operational components of Mission Indradhanush at session site and at community level. In addition, sub regional and regional team leaders monitored the implementation besides the national monitors from the WHO Country Office. A standard set of formats for session site monitoring and house to house monitoring were developed for concurrent monitoring in the field by the monitors, who were also supported by available monitors from partner agencies such as UNICEF and CORE that are already involved with monitoring operational components of routine immunization. All monitors, including field monitors, external monitors were deployed by WHO NPSP for duration of at least 8 days (7-14 April). All available monitors including those from partner agencies underwent a briefing at the district level; these were conducted by the Surveillance Medical Officers. Each monitor visited 4–5 session sites on day 1 and from day 2 onwards, monitored 2–4 sessions per day. In addition, each monitor conducted house-to-house monitoring from the second day of the Mission Indradhanush drive. A monitor should be able to monitor 2–4 areas that have been covered in previous days for house-to-house monitoring. Areas where immunization sessions have been held on the last day of Mission Indradhanush drive were monitored over the next 1–2 days. Information generated from concurrent monitoring was utilized at local level during evening debriefing meetings at block and district level to ensure mid-course corrective actions. Data generated from the monitoring formats was collated in a data tool to generate key indicators that was shared at all levels with the Government. To meet and sustain coverage goals under Mission Indradhanush, a well-carved strategic communication plan was put in place reaching out to communities and hard-to-reach populations and building trust in health care services. As a multi-pronged communication approach is crucial for the success of the mission, it becomes imperative that the communication efforts are monitored closely. This monitoring system is used to take immediate corrective action for improvement and for evidence based and focused implementation of communication plan for Mission Indradhanush. The communication monitoring is intended to measure progress of various IEC/BCC activities at a particular time and at a particular implementation level. As per the updated partner monitoring mapping, lead reproductive, maternal, neonatal and child health (RMNCH) partners and UNICEF covered all 201 districts. While UNICEF covered 187 districts, 812 blocks in 21 states. Rest of the districts and blocks were covered by other lead partners. For the monitoring of Mission Indradhanush, national level monitors have also been assigned One for each district, placing 201 monitors for 201 districts. These monitors have been pooled from various partner agencies viz, Ministry of Health and Family Welfare, National Health System Resource Center, National Institute of Health and Family Welfare, CORE, UNDP, ITSU, DELOITTE, BMGF, JSI, IPE Global, Rotary, UNICEF, WHO-NPSP. These monitors reach the assigned districts one day prior to the start of the activity and check the preparedness of the district. During their visit to the district, monitors also meet district level officials and give them feedback about their observations on a daily basis. After monitoring at district headquarter, they also visit blocks of the same district on subsequent days for monitoring preparedness at the block level. During their visit, they are also expected to visit session sites and monitor sessions on standard session site monitoring format to assess the quality of implementation of activities. The national level monitors stay in the assigned district for atleast 4 days and visit minimum 3-4 blocks of the districts during the whole monitoring period. The national level monitors use two checklists i.e. District Assessment Checklist and Block / Urban area Assessment Checklist and a monitoring tool for session site. The data entry excel sheet tool based on the filled checklists is submitted by the monitors to Immunization Technical Support Unit (ITSU) by email on daily basis and is compiled by ITSU for feedback. The hard copies of all the formats are submitted to ITSU immediately after the monitor returns from the assigned district. The session site monitoring formats filled by the national level monitors are handed over to local WHO-NPSP office in the district itself.